With over a million people living in Hiroshima, we imagine at least a few residents are still undecided about who to support in the upcoming city council elections. But with less than a month until they cast their votes, it’s time for them to start narrowing down their selection. The multitude of political parties in Japan means that sometimes candidates can start to blur together in voters’ minds, though. Standing out from the crowd isn’t a problem for Naomi Kikuura, however. After all, when was the last time you saw a would-be city councilwoman appear in her political ads doing nurse cosplay? Political campaigning works a little differently in Japan than it does in the U.S. Politicians and political parties don’t really air TV commercials, for example. Instead, most advertising comes on a much more local level. Trucks with speakers mounted to them are a popular method, and you can often spot them driving around residential neighborhoods while broadcasting a message from or about their particular candidate. Another tried-and-true tactic is putting up posters on boards erected specifically for election ads. Getting name and facial recognition is especially important for politicians from newer political entities, something not lost on the fledgling Japan Innovation Party, which was formed just one year ago through a merger of the Unity and Japan Restoration Parties. So when it came time to make a poster for Hiroshima City Council hopeful Naomi Kikuura, the designers chose to bypass the staid, conservative suits that most candidates appear in, and instead dressed the Hiroshima native in something that would have a bit more visual impact. Before making the decision to step into the world of politics, the 38-year-old Kikuura spent 15 years working as a nurse. 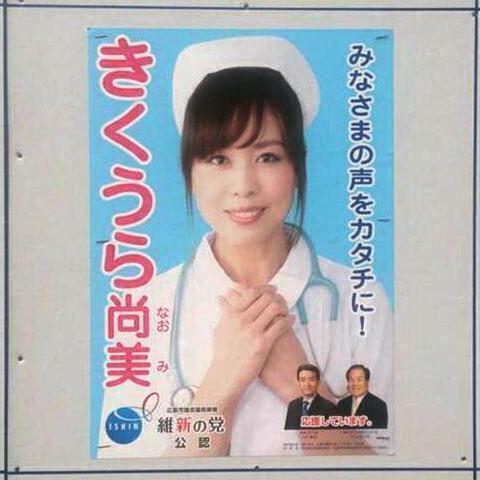 Drawing on her experience working in the field, Kikuura has made a commitment to providing proper medical care to constituents a cornerstone of her platform, and to visually drive the point home, appears dressed in a nurse’s outfit on some of her posters. As a serious candidate for an important office, Kikuura’s wardrobe doesn’t consist exclusively of gray-area cosplay. On the Japan Innovation Party website, for instance, she’s dressed in a blazer, although the accompanying text once again references her 15 years as a nurse. Still, the kind, soothing aura given off by her nurse’s cap and the concerned way she clasps her hands over her chest while dressed in the uniform of her former profession have made an impression with Internet commenters in Japan. We’ll have to wait until the polls close on election day to see how many votes Kikuura receives, but it’s already safe to say that she’s got everyone’s attention.